Slice the eggplant in 1/4 inch rounds, salt and place in strainer (see here for more detail). Preheat the oven to 400 degrees. Lightly oil a cookie sheet with cooking spray. 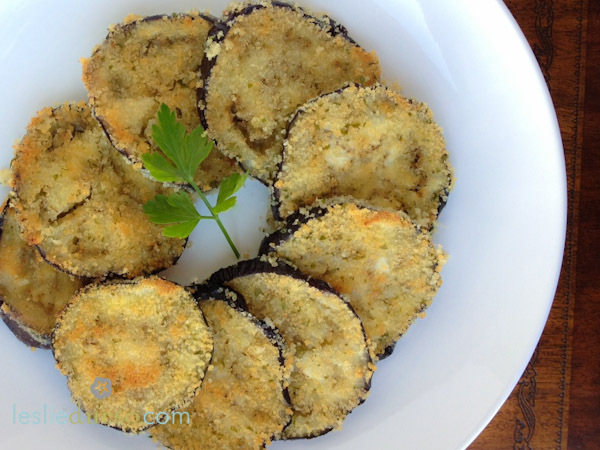 Pat the slices of eggplant dry and paint with the vegenaise and dredge in the breadcrumbs. Arrange on the cookies sheet and repeat. Bake for 15-20 minutes, flipping halfway through, until golden and tender. Eggplant is so very underrated here in the UK. I’m going to try and change that, when i was in america i went crazy for eggplant… Looking forward to creating some recipes again. Wonderful, easy recipe. my kids loved it. Thank you!